Find the perfect acoustic panels for your next project through Architizer’s new community marketplace for building-products. Click here for more information. It’s free for architects. In the age of open-plan offices, flexible co-working spaces and a drive to repurpose every derelict warehouse in sight, acoustic panels now live at the helm of the architecture world. Yet as expressed by Willem Boning, Acoustics Consultant at Arup’s SoundLab, it is no easy or structured task; sometimes applying acoustic treatment can feel like a shot in the dark. “This might be the golden age of acoustic panels. Thanks to open-plan offices and industrial warehouse conversions, designers more than ever need ways to absorb sound in large echoey spaces. This week, we focus on acoustic panels that can be applied on or built into walls to make a room quieter.” Check out the full story here. “To decorate or not to decorate? When it comes to acoustic wall and ceiling panels for commercial typologies, architects must ask whether or not they want a bold statement-making solution or one that seamlessly blends into the walls of a contemporary work-space. Both can be ideal solutions depending on context, but one thing is certain: This specifying decision is a crucial one due to the significant aesthetic impact of these products.” Check out the full story here. “Companies like Hunter Douglas often have trouble helping architects understand the trade-off between clean aesthetics and acoustical performance. Many commercial clients, chasing an industrial interior aesthetic, want to incorporate fully open plenums or concrete ceilings. But these conditions often discourage private conversations and make loud noises sound even louder. If this type of look is integral to a project’s overall design, then the architect should consider using even higher quality products on the ceilings and walls — ones that don’t take away from the edgy design but rather enhance it — to mitigate the noise.” Check out the full story here. “Acoustic design makes a beautiful stage resonate. Tying together sound and structure, architects create ideal acoustic environments through form, materials and spatial organization. In music halls and theaters, acoustic panels are specified to define better experiences. Whether for concerts or individual recitals, modern acoustic panels are integrated through orchestration and assembly.” Check out the full story here. “Acoustical privacy seems a luxury nowadays in many workplaces thanks to the popularity of open-plan office design. While furniture manufacturers have been cranking out screens, dividers, cocoons and booths to rectify this, taking up floor space may not be an option in some settings — so we look to the ceilings and walls. With regards to the latter, several products not only help dampen noise, they make design statements.” Check out the full story here. “The SoundLab’s work represents a seminal precedent within a crucial yet unexplored arena of architectural acoustics. 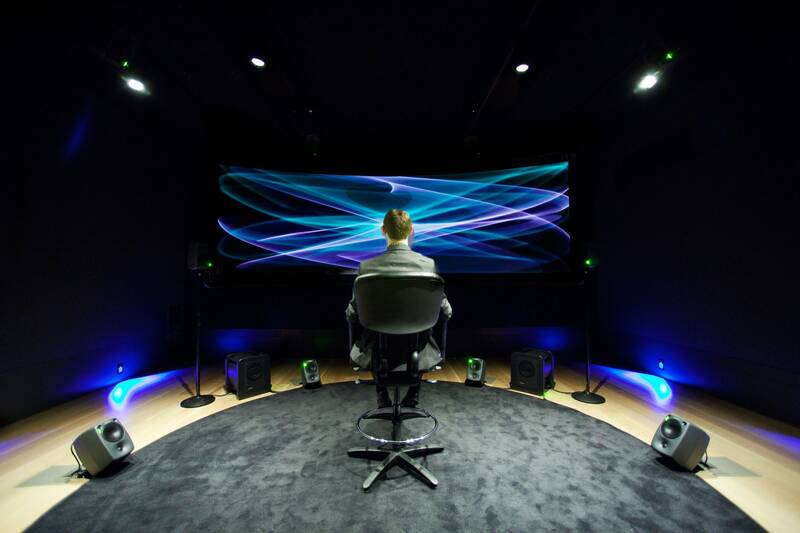 The lab guides clients in diving much deeper than viewing acoustic treatment as a material mask to unkind noise. Instead, acoustic conditions are dynamic and possess feedback effects, which ultimately loop back into how people conduct themselves in a particular space: Upon entry, will you speak up or naturally quiet down? And as adaptive reuse becomes increasingly prominent among offices and co-working spaces, this research will prove indispensable.” Check out the full story here. “One small, mighty and incredibly innovative brand that’s taking the world of acoustic design by storm is Navy Island. Their patented product, SoundPly, is making it easier for architects to choose a versatile interior cladding material that can completely disguise its acoustic function without sacrificing a sleek look. SoundPly is thin and works as a virtually seamless wooden backdrop that diminishes sound in any room.” Check out the full story here. “The design team used several acoustic products to soundproof the entire space since each individual room contains its own different sonic environments. The reception area and lobby features the most striking installation with a meandering curtain of double sided acoustical wood slats. The walls are lined with a clean, striped design of oak and acoustical black fabric. While visually impactful, the design also helps hush the noise coming from the crowds who might wander throughout the space during events.” Check out the full story here. Having a nightmare specifying the ideal acoustic panels for your latest project? Save time, money and your sanity by searching on Architizer’s new online marketplace for building-products. Click here for more information.